Two Mormon boys do anything to share The Good Word. No door, window, or scowl will keep them out. We have hit the presses. Glad you're still sticking it out even though you didn't make the 55! Fingers crossed for the wildcard, great stuff so far! There's some great potential with this concept. Vicar of Dibley and Little Mosque on the Prairie are examples of how the portrayal of people of faith can be fertile ground for comedy. It's a fine line of course. Good Luck! I second Aidan K's tip. You could also try restaurants where they pour cans of pop into glasses. #HelpfulHomelessHints Also I had no idea what this video is about. I thought you were supposed to hype the show! The absolute best place to find cans is often on college and university campuses. #HelpfulHomelessHints. I just read everyone's comments, and I mean everyone's! We are so glad that absolutely everybody loved the video as well as everything else we're doing. We thank you for following us and are exciting for you all to see the actual pilot planned. It will rock, and possible roll! I didn't really find the comedy in this project. The idea has potential but I think you guys could have done better for the hype! Its a funny interaction but the video didn't really tell me enough to get me hyped up. I like the idea of the show but you guys could have stepped it up. Good job with the sell sheet, i like it very much ! Hope to see more of you guys ! I like your sell sheet. It's slick. And I like your idea. I was curious about the character in the video, but don't think it'll help you get press. I'm all for taking a risk, but this seems like you just disregarded the assignment. There's nothing more I want than these boys to stay away from my home, so I guess the best place for them is on TV. Then again, I guess if they get on TV they'll be in EVERYONE's home... hmm. I don't know if this is gonna work. The script was funny and the delivery was good, but there didn’t seem to be much information that would qualify as a media pitch – if this was the only Good Word video I had seen, I wouldn’t have any idea what the show was about or why I should watch it. I would have liked to see the Mormon boys in this! wasn't my favourite of all the videos you have done so far. Too bad you guys didn't make it the show has real potential. Keep working!! The sell sheet is also very concise and visually appealing. 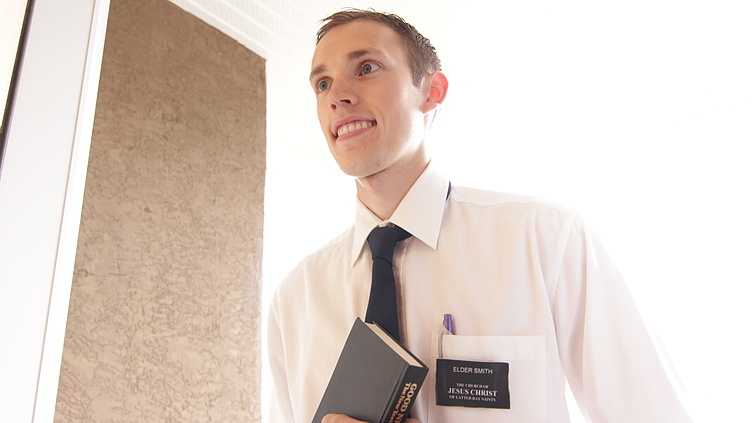 Having experience with the Mormon faith, I say good work, boys! Or should I say “Good word!” I look forward to seeing more! This is a very different way to give a press release. It is definitely thinking outside the box. I'm not sure if you told me enough about your concept but maybe I don't think outside the box enough. Good luck in the challenge and I will have a look at what comes next. Hello team Good Word! Keep it up!